l. The last believer to have seen the risen and glorified Christ. 2. The last enemy to be destroyed. 3. In the last days these individuals will be more prominent thn ever before. 4. The last state of this man is worse than the first. 5. The last book of the Old Testament. 6. The number of the last psalm. 7. These evil ones feared that the last error might be worse than the first one. 8. The last word Jesus spoke from the cross. 9. The last meal Jesus had with His disciples on earth. 10.The last miracle of Jesus before His death on the cross. 11.The last words of the Bible. 12.This God created on the last day of the creation. 14.Joseph’s last request of his brethren. 15.The last of the chosen Twelve to believe in Christ’s resurrection. We in the CLC have been blessed by an increasing number of our women going overseas as Mission Helpers since we started the program over nine years ago. And it is good to hear their glad reports on blogs and in person. There was one eighten year old girl who said India was ugly and she hated it there. She got tired of all the poverty, famine and death. She said she wanted to be like the other girls in the USA and marry a millionaire. This girl, Ida Scudder (1870-1960), who was born in India got tired of trying to force bread into the mouths of malnourished children. Though her father was a doctor and helped a lot of people that was not the life for her. Although she said she was a Christian, she was really hankering after the god mammon. Not wanting to spend her life in India she went back to school in the USA. She returned to India when her mother was very ill to help take care of her, though this was not going to be a permanent stay. One night while she was at her parents’ home in 1892, something happened that changed all her plans. Dr. Scudder was trained in medicine, though his daughter was not. On that night a high caste Brahmin came to ask if she could come and help his young wife who was in labor. There were problems and it was not going well. Ida said she couldn’t as she did not know how to help, but her father could come. The Brahmin said he would rather have his wife die than to have a man come into his house to his wife. And she died. Later that night a Muslim man had the same problem of a wife who was in labor. He asked Ida to come, but Ida just could not. She again offered her father. The Muslim man left saying no man would look on his wife’s face. Still later that same night another Hindu man came with the same problem of a wife in labor who was too young to really bear a child. The same result of an offer of her father met with refusal of this unclean man to come to his wife. Ida was greatly troubled to say the least of that night’s happenings. The book she had started to read that night she could not continue with and had trouble even sleeping. She asked around in the morning about those three women and found that they had all died. It was then that Ida in her prayers learned to say not my will be done but Thine. She determined to go back to the USA, study to be a doctor and return to India. This was not a simple matter in the 1890’s like it is today. But God had shown her His will and God blessed her efforts. She was even able to return with money for clinic work. When she returned, her troubles were only beginning. The traditional practitioners among the Hindus have some good remedies, but some were pure hokum like an eye disease treated with a potion of ground glass and pepper. The Hindu priests were fervent in their many superstitions and interferred. In 1903 when the Black Death was killing people right and left the rumor was spread that the innoculations being given were actually a plan by the British to reduce the Indian population. As Ida worked to show the love of Christ, it was in the face of many people praying to gods and goddesses and sacrificing animals to appease their deities. It is important to take note of Ida’s perseverance and method. She would travel about to remote villages with a bullock cart full of medicines. And as she administered medicine she always prayed with those visited and asked if they had any questions about Jesus or Christianity. In this subtle way she witnessed to Him by her actions and always stood ready to speak of the hope that was within her. A lot has happened since the days of that medicine-laden bullock cart. Beginning a clinic in her house with one bed on January 1, 1900, her work has now produced a hospital of over 2100 beds with very fine care and a good reputation far and wide. She began to train women for medicine and from that there is now the Christian Medical College at Vellore. She learned as her Lord had taught, “If any man would come after Me, let him deny himself and take up his cross daily and follow me.” If any of you are able to come to India, you can travel along NH #4 from Chennai toward the BELC’s Vaniyambadi District and along the way stop in Vellore and see what God did through a girl who hated ugly India. Though we don’t of course agree with some of her Dutch Reformed teachings, we have to be amazed at what God does with such wretched selfish sinners as we are. Ida was yet another case of His Amazing Grace. l. Paul. I Cor. 15:8. 2. Death. I Cor. 15:26. 3. Scoffers and mockers. 2 Peter 3:3. 4. The man who allows the evil spirit to make a return visit. Matt. 12:43-45. 7. The chief priests and the Pharisees. Matt 27:62-66. 8. “Father, into Thy hands…” Luke 23:46. 9. Breakfast on the shore of the Sea of Galilee. John 21:1-14. 10.Healed the ear of Malchus. Luke 22:50,51. 11.”The grace of the Lord Jesus Christ…” Rev. 22:21. 12.Cattle, creeping things, the beast of the earth and man. Gen. 1:26-31. 14.Asked them to bury him in Canaan. Gen. 50:22-26. 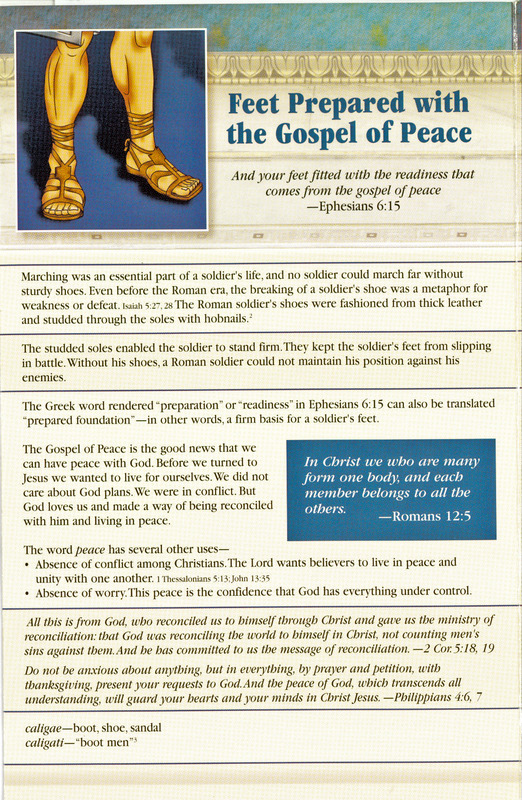 Fourth of Armor of God in an attachment.